Since my memory is not as good as it was since before I can remember, I’m changing things up here. I mentioned in my last post that I have 18 ties to write about, and I can’t keep letting weeks (oh, ok, months) go between wearing and writing about ’em. There are just too many things that are going on in life, and I want to make the posts timely. So, this post will actually be for a tie that I wore today; I’ll probably post about a past tie tomorrow, or on a day that I don’t wear a tie. Must. Catch. Up. 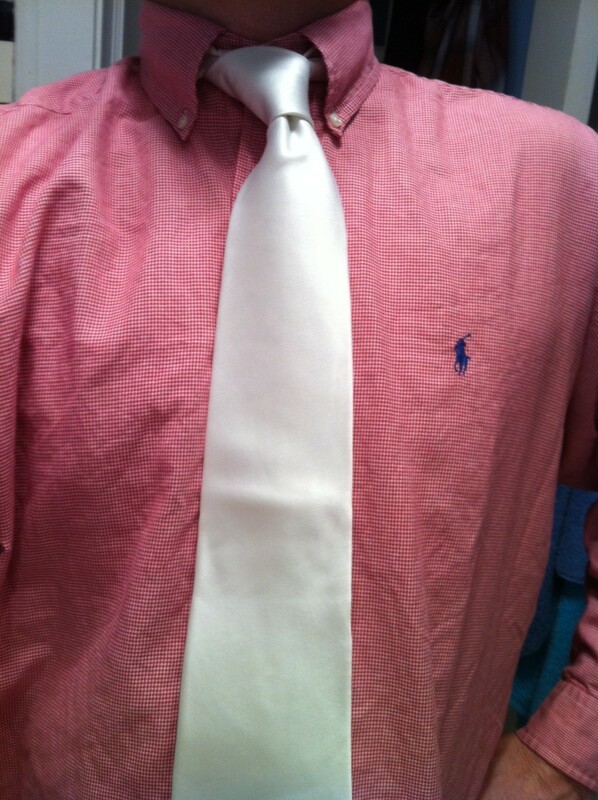 So, my Tie du Jour, I’m afraid to say, reminds me of Alabama’s colors, crimson and white. It’s from Arrow, and it is pure white. Of course, I wore it with a red, checked shirt. I blame the fact that it was early in the morning when I got dressed. I did tone it down a bit, wearing a gray (British eq: grey) v-neck sweater over it all. Not sure if this one will make it to TieXchange. Yeesh…my Cajun relatives will be very upset with me. I probably shouldn’t mention that I had a gorgeous, purple and gold strip from Lee Allison, ready to go. I’ll just wear it tomorrow, after they win. I have a New Orleans Saints tie that I’ll need to sport by the end of the week. Got to show some love for the state of my conception*. So, tomorrow’s subject will be based on the winner of tonight’s game: Geaux Tiegers or Roll Tied Roll. A little bet with myself. *No, I do NOT know the actual story of my conception. (Ew.) I do, however, know that my parents moved to Memphis 6 months before I was born. Math. Conception. Know it. We have a couple of GWTs here…one Guy With Tie and one Girl With Tie. Our GuyWT is Chip Grogg (call him Grogg). I met him with his business partner, Sallie Arant, a former neighbor of mine. 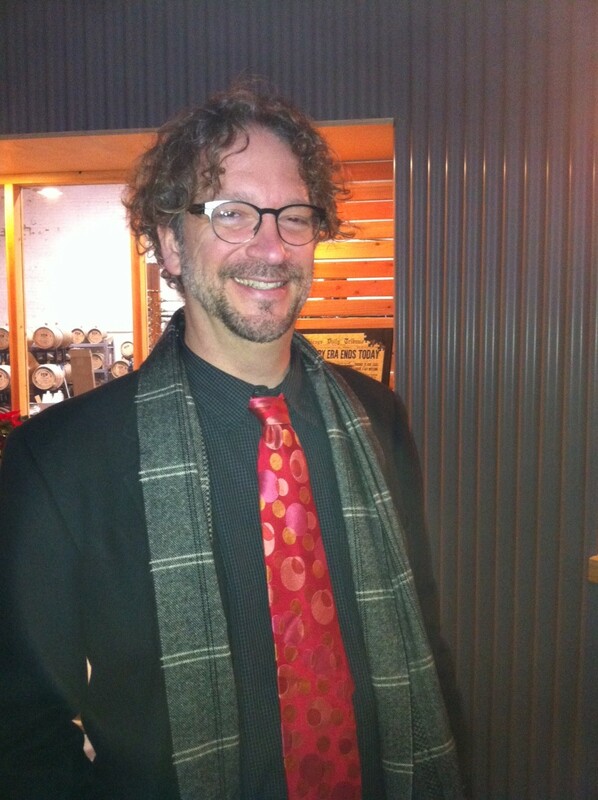 They’d stopped by the distillery, and he was wearing this very cool, vintage tie. 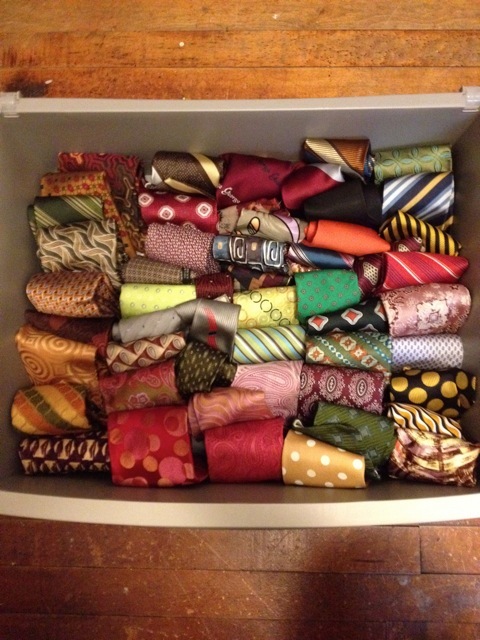 He upped the ante by sending this shot of his tie cubby. Oh, man, some of these fabrics are soooooo cool. Color me jealous. 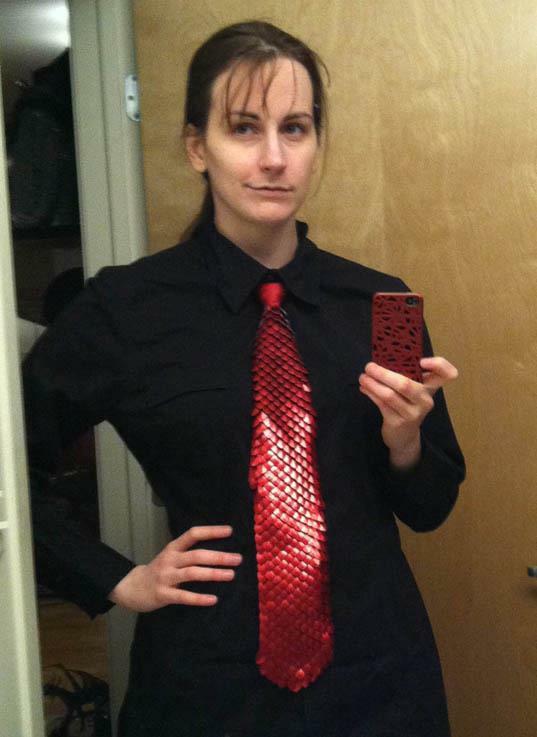 But, check this tie out…Vanessa Walilko has a jewelry/fashion design company called Kali Butterfly. Amazing chainmaille necklaces, bracelets, earrings, even clothing. She made this scale tie…it resembles a beautiful fish, doesn’t it? I’m afraid I may have to wear this one day. Kinda even matches her phone case, dudnit?